Session Bingo is an online feature across a small number of online bingo sites. Just like playing in your local bingo club. Session Bingo is an online feature across a small number of online bingo sites. Just like playing in your local bingo club! Session Bingo is a type of promotional game where everyone buys online books for the same low-cost fixed-price for a set amount of games at certain times throughout the day. Usually, Sessions has either 90, 75 or a mix of bingo games. which run in 3 - 4 Sessions a day (morning, noon, afternoon and twilight) lasting around 1 hour. Everyone in a Session pays the same for a set of tickets and everyone has an equal chance to win at any time. Session Bingo times and prices vary between bingo sites, and we recommend you check with each bingo site with bingo sessions. Operating on the Gamesys Platform, Heart Bingo has a mix of 90 Ball, 80 Ball and 75 Ball Session Bingo Games. Along with Bingo, you can enjoy fun in the dedicated Chat room with games and quizzes. Session Times: Four Sessions take place a day: 10am to 11am, 3pm to 4pm, 7pm to 8pm, then 11pm to midnight. Advance-buy tickets available up to 7 days from the Session Bingo Tab. Session Prices: Each Session costs £5 for the bundle of tickets, except on Mondays they are currently half-price. Like most Bingo games, prizes depend on how many people are in each game. (Prices & Times Subject to change). The Sun Bingo has 4 sessions on the Virtue Fusion Platform that you can take part in for one whole hour of bingo for one fixed price. 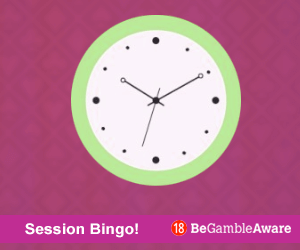 Locate the Session Bingo tab in the lobby to buy in advance. Session Bingo Times & Prices: Four Sessions take place a day: 10am to 10.52am, 3pm to 3.52pm, 7pm to 7.52pm, then 11pm to 11-52pm. Session Prices: £3 for the Morning, £5 in the afternoon, £10 in the evening and £3 in twilight hours. 12 Games in each session. Prizes dependent on how many players purchase tickets for each game. (Prices & Times Subject to change). Fabulous Bingo which is the Sun Bingo sister site has session Bingo Games which you can play morning, afternoon and night. Pre-buy your bingo tickets at a fabulous fixed price and play at home or on the go for great game prizes and our exclusive Session Bingo Jackpot. Jackpotjoy Bingo Sessions are a fantastic opportunity to buy a bundle of Bingo tickets for 15 different games with a mix of 90 Ball, 80 Ball and 75 Ball games for one price to play in the dedicated Session Bingo room. Session Prices: Morning and Twilight bingo sessions cost £5 each, Afternoon Session £7.50 and the Evening Session £10. Each one has 15 games. (Prices & Times Subject to change).